Create One-of-a-Kind Buildings For Your Layout! The "1-Kit" takes you beyond the limits of traditional kits by providing you with a set of basic laser-cut basswood parts that can be endlessly modified so you can scratchbuild just about any kind of wooden structure. The basic 2-story wall sections feature clapboard siding on the front and partially laser-cut window and door openings on the rear. Simply cut the wall sections to size or combine sections for multi-story buildings and remove openings to add doors or windows where you want them. 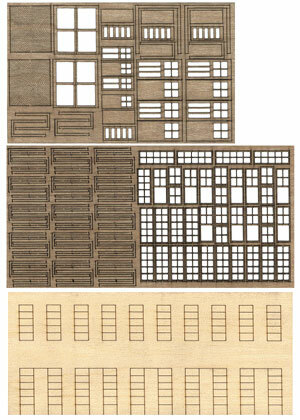 Separate laser-cut windows can be assembled in the stock 10-pane style, or easily modified to smaller configurations. All doors and windows assemble in layers and feature separate frames so multi-color paint jobs are a snap. All you need to add is your favorite roofing material and any detail parts to complete your model. Copy this Laser-Cut Modular Structure Kit: The 1-Kit™ to your MY ACCESSORIES roster.